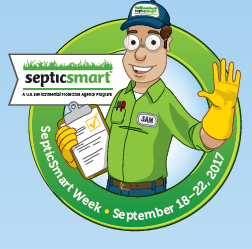 September 18-22 is SepticSmart Week! Nearly one-quarter of all American households depend on septic systems to treat their wastewater. There are approximately 58,000 septic systems in Kitsap County! Failure to maintain a septic system can lead to back-ups and overflows. This can result in costly repairs, well contamination, polluted local waterways, and risks to public health and the environment. The fourth annual SepticSmart Week is Sept. 18-22, 2017. 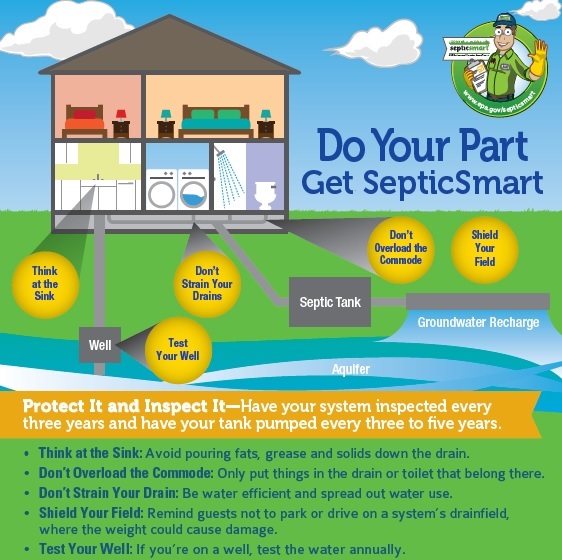 We are working with the Environmental Protection agency and other agencies from throughout the U.S. to remind homeowners and communities to care for and maintain their septic systems and be SepticSmart! Septic repairs and failures: Is your septic system failing? We can help! Check out our Septic Failures and Repairs page for more information and resources. There is a low-income loan program for homeowners facing expensive repairs. The best way to avoid the expense is to maintain your system. Operations and maintenance: Most people don't think about their septic system until it is not working. You should look at the maintenance of your septic system as you do the maintenance of your car—it needs periodic inspections and maintenance to run properly and last as long as possible. Our Homeowners Guide to Onsite Septic Systems is a great source of information.